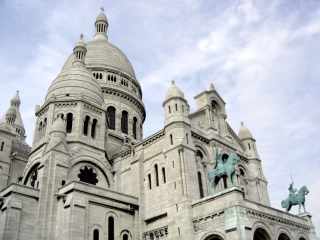 Perched on the hill of Montmartre, the Basilica of Sacre Coeur can be seen from many places in Paris. The Basilica was built after France's defeat in the Franco-Prussian war of 1870-1871. It was first funded by Parisian Catholics as an act of contrition for the moral laxity of their city, which they felt was to blame for the defeat by the Prussians. It was also built "to expiate the crimes of the Communards", as well as to commemorate those who lost their lives in the Franco-Prussian War and the Commune Uprising. The National Assembly, the Assemblée Nationale, soon voted to make the Basilica a state undertaking following much debate. Many believed it to be a religious endeavor and not suitable for government involvement. Others disapproved of the location which honored the Communards. It ended being mostly paid for by donations from the public at a cost of 40 million francs. A competition was held and from the 78 entries the design by architect Paul Abadie was selected. The plans for the new Basilica were in the Romano-Byzantine style. Few buildings of this style were being built during this time and none in Paris. 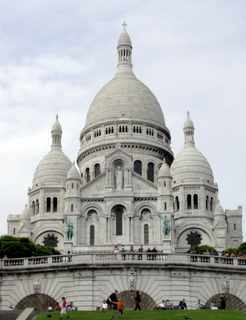 The first stone was laid in 1873, but, the Basilica of Sacre Coeur wasn't completed until 1914. Because of WWI, the Basilica wasn't consecrated until 1919. When it was consecrated it was declared a basilica. The Sacre Coeur, the Sacred Heart, is not a parish church but an independent sanctuary, a place of pilgrimage. The Basilica of Sacre Cur is made of a travertine which exudes calcite, bleaching the stone with each rainfall so that it doesn't require cleaning of the city's pollutants. The interior of the basilica contains one of the world's largest mosaics called, "Christ in Majesty". It depicts Christ with outstretched arms. The Dome is 83 meters high and is open to the public by way of a narrow stairway of some 234 steps. It is well worth the climb. 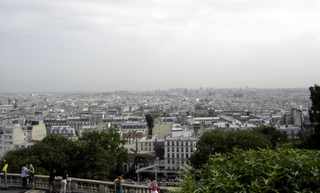 At the top, you are treated to a spectacular panorama of Paris. On a clear day, you can see nearly 20 miles. The great bell, the Savoyarde, was cast in Annecy in 1895 and weighs 19 tons, one of the heaviest bells in the world. The Basilica is open daily from 7 a.m.-11 p.m. There is no charge to enter the Basilica. The Dome climb, however, costs 3 euros.